Ex-Yammer executive Georg Ell joined FuzeBox as general manager EMEA in late 2013 to lead its European expansion. 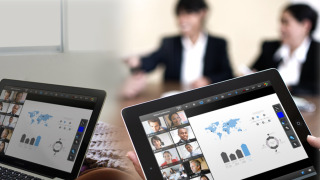 FuzeBox - which is looking to take on Cisco, Microsoft, Polycom and Google in the enterprise collaboration arena - combines video conferencing with interactive collaboration features that lets employees share high resolution images videos, presentations and documents. The California-based company counts Groupon, Evernote and GM among its customers. It's now looking to expand its operation globally on the back of $26 million (around $43 million, or AUS$49 million) in funding. We spoke to Ell to find out more. TechRadar Pro: Can you bring us up to speed with the company's history? Georg Ell: FuzeBox was founded in 2009, and is focused on redefining workplace communication and collaboration. We believe the next generation of workplace tools should match the beautiful, low-friction experiences people enjoy in their personal lives. At work, people need to collaborate in scheduled and ad hoc ways with people inside and outside their organizations, while using a variety of devices from different locations. We've built easy-to-use tools powered by a distributed cloud architecture to meet these needs. We've assembled an experienced team and recently raised additional funding to drive our ambitious goal. FuzeBox is headquartered in San Francisco, California with offices in Palo Alto, Seattle and Sofia, Bulgaria. Early in 2014, we will open European headquarters in London to support global expansion. Europe has been an early adopter of FuzeBox from an online and mobile perspective. We anticipate it will be one of the fastest growing markets and we plan to support the region accordingly. TRP: There's some interesting activity in the collaboration space from Skype, Blue Jeans et al. How does FuzeBox stand out from the crowd? GE: There is a lot of exciting innovation in the enterprise collaboration sector, which is great news for everyone. Workers are desperate for better tools to help them get work done and SaaS and mobile apps allow them to bring their own applications to work. We've seen this happen with cloud-based file storage and services like DropBox and Box and with enterprise social networking tools like Yammer (my previous employer). To date, there hasn't been an easy, cost-effective way to deliver interactive visual communications as part of a flexible collaboration experience with confidence and quality across all devices. We believe there is an opportunity for disruption in this market and are focused on leading the shift. There are other players attacking the challenges around interoperability of video systems, which we think is important and are also addressing, but interoperability alone doesn't ensure a good user experience – it can actually have the opposite impact. FuzeBox is focused on making it easy for people to connect across devices while delivering a high-quality, consistent user experience. Delivering this type of simplicity, quality and experience requires some sophisticated technology within the architecture and the applications to optimize the experience based on real-time network conditions. It is not a simple problem to solve, but, in our view, it is the most critical. FuzeBox has been building this technology for more than five years, so we are well positioned. TRP: What can you tell us about FuzeBox's business model and why you think it's the right one? GE: FuzeBox is a cloud-based platform for real-time communication and collaboration – voice, video and sharing of content. It's a single platform and consistent user experience across devices from smartphones and tablets, to desktops, to conference rooms. Native apps allow us to provide the best user experience, with beautifully simple interfaces and consistent, high-quality audio, video and sharing of content across networks. We also introduced the first, true freemium business model in this space, which means people around the world can use Fuze with their friends, customers and partners for free. Freemium drives us to focus on the user experience and gives us a large pool of aggregate behavioral data to fuel continuous improvement and innovation.